SCOTS singer KT Tunstall has written about the blues of a different kind after penning a song for the new Smurfs movie. KT from St Andrews who has just joined Simple Minds on their European tour admitted she was chuffed to bits for her music to feature in new movie Smurfs: The Lost Village. 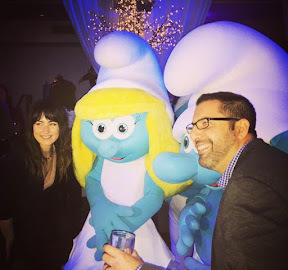 She said: "I'm so proud to have written a song for the new The Smurfs Movie Smurfs: The Lost Village. You Will Always Find Me in Your Heart was co-written with the amazing Chris Lennertz- one of my favourite people in the world. It premieres next week." KT who will play Kelvingrove bandstand on August 4 said she initially thought about singing on the song but decided it was better someone else featured on it. She said: "I'm not singing on it. Shaley Scott is. - I gave it a go but sounded like Joan Jett- not quite what the scene needed. But don't worry, I did sing on a massive hands-in-the-air Ibiza remix version we did for fun." The film was released nationwide on Friday April 7 and now KT, who recently signed to US label Rostrum Records Stateside is now on tour with Simple Minds. She said: "I'm kind of overwhelmed that I head to Europe on Wednesday for seven weeks. Touring with Simple Minds Official is such a dream. I have really missed playing in Europe and haven't been over much in recent years, and not only can't wait to go, but also playing many places I have never played before. It's a true adventure."